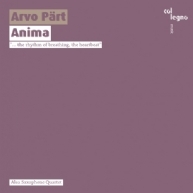 Arvo Pärt, by virtue of his distinctive, soulful music, enthuses his audience like no other contemporary classical composer. This album is the first-ever compilation of all compositions by Pärt that have been transcribed for saxophone quartet – revealing them, so to speak, without words, “only” through breath, through oscillating columns of air. The Italian Alea Saxophone Quartet master this task brilliantly. Even Hector Berlioz praised the sound of the, then newly invented, saxophone, likening it to the “mysterious vibrations of a bell, long a er it has been struck.” Which takes us straight to Arvo Pärt’s unique style of composition, also known as tintinnabuli, Latin for: little bells. When Thomas Mann, in his novel Doctor Faustus, writes on the subject of music that “this strange form of art, by its very nature, is capable at any given moment of starting anew, ... of rediscovering itself, of regenerating,” and thus of “reaching, alone and unheard by the world, miraculous heights of the most peculiar beauty,” he almost appears to anticipate the tintinnabuli style so dubbed by Arvo Pärt himself. Following his estrangement from the postwar avantgarde, once passionately championed by the composer in the difficult territory of the Soviet Union, and after years of seeking that had begun in 1968, the development of this style from 1976 onwards marks a new beginning, both on a personal and on a fundamental level: the task of reconstructing music from its elementary components replaced the aesthetic ideal of unfettered freedom formerly promoted by the avantgarde. Saxophones and spirituality: a challenge? A distinctive feature of Arvo Pärt’s work is that it lends itself to different interpretations, both vocally and instrumentally, adding new expressive layers while maintaining the original characteristics. In each of the numerous versions of his compositions, the spiritual purity inherent in Pärt’s poetry is always at the forefront. For this reason, I felt very enthusiastic at the prospect of playing such profound and significant music on the saxophone, an instrument that is still too often associated with lighter musical genres such as jazz and pop or merely perceived as superficial and loud. With thirty years of experience performing as soloists as well as in various saxophone quartets, music ensembles and chamber music groups, Gianpaolo Antongirolami, Roberto Micarelli, Luca Mora and Gabriele Giampaole i decided to form the Alea Saxophone Quartet in 2006. Before reconfiguring themselves as a contemporary music ensemble, the Alea Saxophone Quartet concentrated on early 20th century French music, as well as on crossovers between jazz and classical music. The reason for this change in direction was to broaden the scope of their sound and to expand their repertoire. The Alea Saxophone Quartet engaged with the works of some of the most important European and American composers of the second half of the 20th century and of the 21st century, including Sciarrino, Donatoni, Xenakis, Andriessen, Cage, Riley, Nyman, Reich, Glass, Lang, Fitkin and Torke. They performed works by the above composers at major contemporary music festivals and most notably, Salvatore Sciarrino’s Pagine at the 4th Centenary Celebrations of the birth of Carlo Gesualdo da Venosa. Several of the group’s performances (e. g. at the Rassegna di Nuova Musica in Macerata) were recorded and broadcast by RAI Radio 3. The Arvo Pärt project was a significant milestone in the group’s artistic odyssey. In 2015, on the occasion of Arvo Pärt’s 80th birthday, the Alea Saxophone Quartet performed the complete saxophone quartet works by the Estonian com- poser at a string of concerts throughout Italy. The 70th edition of the Sagra Musi- cale Umbra featured the world premieres of six out of eight of these compositions. Aside from performing with the Alea Saxophone Quartet, individual members of the ensemble regularly appear at other international events in Italy, Austria, Germany, France, Croatia, Switzerland, England, Spain, Romania, Israel and the USA. Musical collaborations include luminaries such as Terry Riley, Butch Morris, Mike Svoboda, Garth Knox, Arno Bornkamp, Horacio Vaggione, Gian- carlo Schia ni, Stefano Scodanibbio, Otis Murphy, Roberto Fabbriciani, Alvise Vidolin, Michele Lo Muto, Matteo Cesari, Daniele Roccato and Marcus Weiss. A number of recording sessions by the quartet have also been broadcast on national radio and television. As an ensemble as well as solo musicians, members have performed with the Orchestra Sinfonica della RAI di Torino, the Orchestra Filarmonica del Teatro La Fenice di Venezia, the Orchestra I Pomeriggi Musicali di Milano, the Orchestra del Teatro Lirico di Cagliari, the Orchestra Haydn di Trento e Bolzano, the Orchestra Filarmonica Marchigiana, the Orchestra Sinfonica di Bari, the Orchestra Internazionale d’Italia, the Orchestre National Bordeaux-Aquitaine and the Oradea State Philharmonic Orchestra in Romania. Members of the Alea Saxophone Quartet are also involved in didactical activities, teaching saxophone at various music conservatories in Italy and holding regular master classes at institutions throughout Europe, including Keele University and Edinburgh University (UK), Hochschule für Musik Freiburg (Germany) and Mozarteum University Salzburg (Austria). 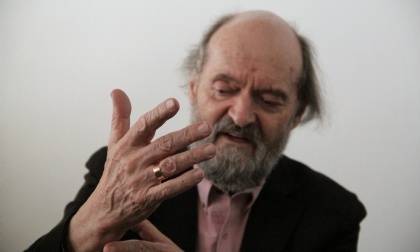 Arvo Pärt was born in Paide (Estonia) in 1935. After studying composition with Heino Eller in Tallinn he worked as a sound engineer with Estonian Radio from 1958 to 1967. In 1980 he and his family emigrated to Vienna, a year later Pärt moved to Berlin on a DAAD fellowship. He currently lives in Estonia. In his development as a composer Pärt, who is considered to be one of the most radical protagonists of the so-called Soviet Avantgarde, underwent a profound evolution. Neoclassicist piano music marked the beginning of his early period, followed by a decade dedicated to finding his own approach to the most important compositional techniques of the avantgarde – dodecaphony, sound mass composition, aleatoricism, collage. Nekrolog (1960), the rst dodecaphonic composition in Estonian music, and Perpetuum mobile (1963) earned him first recognition in the West. In Pärt’s collage pieces avantgarde music and old music are confronted with each other harshly and irreconcilably; this confrontation is taken to the utmost extreme in his last collage piece, Credo (1968). From that moment, all the compositional means and techniques he had used previously became meaningless to Pärt, had lost their appeal to him. Searching for his own voice he went on a creative hiatus that lasted almost eight years, during which time he studied Gregorian chants, the Notre Dame school, and classical vocal polyphony. in his work ever since. The tintinnabuli principle does not strive for a progressive increase in complexity but is aimed at the utmost reduction of sound materials and a limitation to the essential.